We offer a variety of flavours from A - Z in bulk quantities. Take your pick below between 5.7 litres to 11.4 litres that are ready to be served. Individually packaged stick novelties, gelato sandwiches, mini-cups, calipops & cono palla are perfect for any establishment offering grab and go options. Restaurant ready single portion specialties and ready to serve gelato cakes and pies. 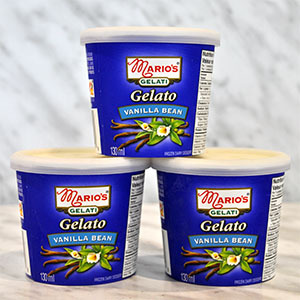 Make sure your gelato shop is well stocked for success. You’ll need these gelato supplies to keep your business running smoothly.